Jet lag will be the end of me. Adult jet lag is bad enough on its own, but a Toddler jet lag takes Parenting to a whole different level of difficult! You see, I had read plenty on how to keep the little ones entertained on board a long plane journey, but nowhere did I come across ways to tackle the after effects. 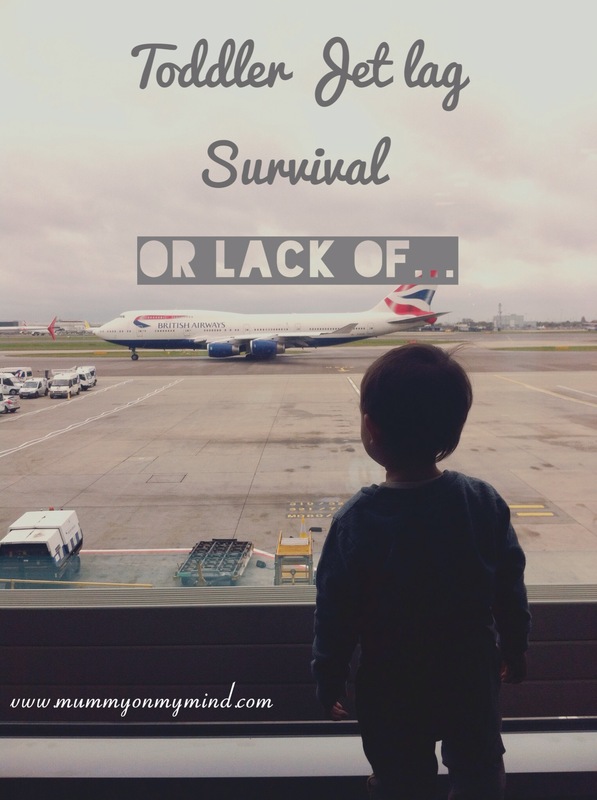 Being so preoccupied in worrying about the plane journey, Jet lag simply slipped my mind, Well, this jet lagged mummy is about to tell you just how horrific a jet lag toddler can be. Move aside, “Terrible Twos”, you have competition! The flight itself was an absolute pleasure. I even managed to watch a movie whilst Baby Z napped on me. The rest of the time flew by as I engrossed Baby Z in new toys and food. The first night we arrived at Dubai International Airport at approximately midnight, and by the time we were in bed at home it was close to 2 am. However, in my toddler’s brain the time was still 10 pm, which meant he went straight to bed without much fuss. The day after is when the horror story began. Afternoon nap was simply not to be had, until Baby Z finally fell asleep after a tantrum (or two…or three) in the living room on the sofa. It was already 3 pm by this point, and he normally has his afternoon naps at around 1 pm. The clock chimed 4 pm and this is where I made my rookie mistake. I let the boy sleep. Until 5 pm. How silly of me! He did indeed wake up fresh. So fresh that he did not want to go back to sleep until 2 am that night. It was exhausting to say the least, especially because there was a lot of crying and frustration involved, from both parties! The third night gave way to an improved nap time, and a less improved bed time of 11 pm. We are getting there. Slowly, but surely. When we flew to the UK last month, the jet lag wasn’t this noticeable. Yes, his sleep patterns changed but not without this much commotion, and definitely for not more than a day or two. I think the reason behind this is the fact we went 3 hours back during that trip, rather than 4 hours forward this time around, which seems to have made things so much worse. Baby Z strives on his routine, and I understand that I just need to give him some more time to adjust, which I am doing. To top it off, my little angel is teething again (after a very long gap!) and he also turned 18 months today. He is officially 1 and a half years old (How did this happen?! ), so I am sure that must mean he is going through some huge wonder week milestones too. Especially since I have noticed he has picked up so many new skills in the past few weeks. I guess all that takes its toll on a toddler. Patience and love is key, but a wailing toddler and sleep deprivation does crazy things to your sanity. How have you tackled jet lag with your baby or toddler? Feel free to share your tips and tricks in the comments section below. For the sake of a mother’s sanity, please share!